Supersonic passenger transport is mounting a come back. Even so, flying at twice the speed of sound is old news. The next frontier will be on-demand aviation in an urban setting, meaning the arrival of the long promised flying car. In 2016, Uber, the global ride share company, floated the idea of small, jet-powered, electric vertical takeoff and landing (VTOL) aircraft zipping first between suburbs and cities, and eventually within cities themselves. 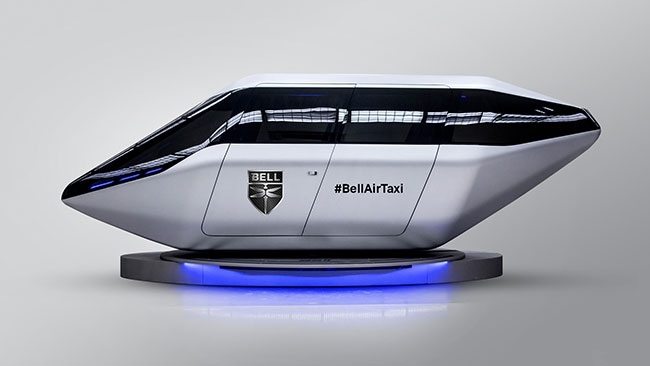 Bell’s on-demand Urban Air Taxi concept was on full display in early 2018 at the Future of Transportation World Conference in Germany. It is one of many concept vehicles Supersonic passenger transport is mounting a come back. The company estimates that the average San Francisco resident spends 230 hours a year commuting between work and home. It also says on-demand aviation can cut an approximately two-hour commute to 15 minutes. Uber, which would monetize rather than develop the technology and infrastructure, expects a first generation of air taxis to be airborne in Dallas and Dubai by 2020, with intra-city air tax service available after 2023. In February, Vahana made its first flight from the Pendleton UAS Range in Pendleton, Oregon. Developed at A3, a Silicon Valley outpost of Europe’s Airbus, Vahana is seen as a milestone in launching urban air mobility, aka, the flying car. “In just under two years, Vahana took a concept sketch on a napkin and built a full-scale, self-piloted aircraft,” said Zach Lovering, the project executive of Vahana. Demonstrating that there is more drone than chassis in the evolution of the flying car, the vehicle spent 53 seconds in the air without passengers, reaching a height of five metres. Even if the aircraft is viable (and there are some huge technological challenges), what of the ecosystem needed to support an urban flying network, including vertiports and a regulatory framework? Uber estimates it would need 1,000 aircraft and 83 vertiports with 12 charging stations each to support a sustainable service in up to four cities (Los Angeles was recently added to the list). “UberAIR will be performing far more flights over cities on a daily basis than has ever been done before,” Jeff Holden, Uber’s chief product officer said in a statement. That means integrating a fleet of air taxis with other aircraft, including police and news helicopters that occupy the skies in many urban areas. São Paulo, Brazil, for example, experiences hundreds of helicopter movements a day. Uber has signed an agreement with NASA to develop software to support a taxi network. The agreement aims to solve issues involved in operating hundreds or even thousands of driverless aircraft over urban areas and allow them to co-exist with existing air traffic control systems, reports Reuters. The agreement tacks onto work NASA has completed with a number of industry partners to develop UAV air traffic management systems. NASA has already tested driverless air traffic management over sparsely populated regions. This year, the agency plans to test services over moderately populated areas, followed by testing in high-density urban areas in 2019, when Uber will become directly involved. Even after 2023, highways are not going to morph into makeshift runways to rise above traffic snarls, and while a fleet of air taxis may cut commute times, it is not going to be driveway to doorway service. For the flying car industry, a sufficient number of spots to land and takeoff (with charging stations) will be the biggest operational challenge. “A small number of cities already have multiple heliports and might have enough capacity to offer a limited initial VTOL service,” Uber reports. But these will have to be in the right locations, easily accessible from street level, with the space for up to 12 charging stations. Then there are the aircraft themselves which will have to be quiet enough to blend into the urban noise-scape, and deliver zero operational emissions. Both concerns can be met by electronic propulsion, but what about keeping the payload in the air? Existing battery technology cannot support the gross weight (which will likely include a pilot, at least for the first few years of operation) needed to transport passengers over long distance commutes, and cannot be recharged fast enough to support a sustainable, high-frequency ridesharing operation. Uber expects battery technology to advance to support intra-city ridesharing over the next five years. And what of the cost? Uber estimates the per passenger cost of a 91-km trip (one hour, 40 minutes) to be US$129, or only 17 per cent more than a similar distance covered by Uber X. Over the long term, that would drop to US$20. Manufacturers will develop a series of vehicles to support different speeds, range capabilities and passenger capacity. There is a lot of work to do between now and 2020, including creating a regulatory environment to prevent the industry from descending into the wild west, similar to what happened during the dawn of the first motorized traffic age.